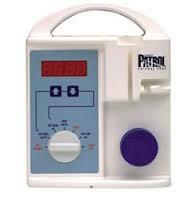 Buy or rent pre-owned, recertified Ross Patrol Enteral Feeding Pumps you need today. All pre-owned medical equipment is patient ready equipment and is covered by an OEM matched warranty. Rechargeable sealed lead acid, 6 V; the pump will fully recharge in a maximum of 4.5 hours while pump is off, or 12 hours if the pump is operating, When fully charged, 8 hours at 125 mL/hr.